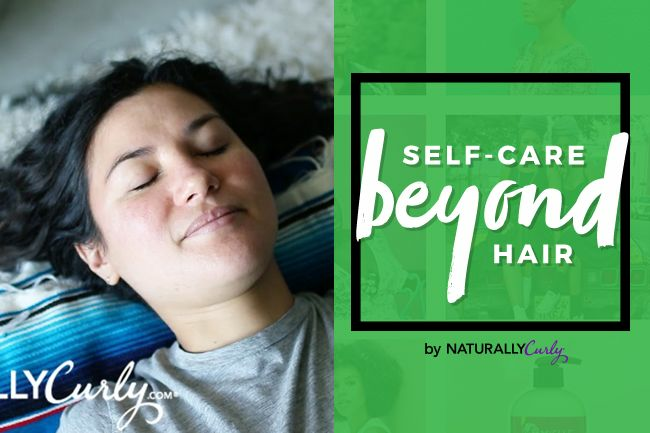 This month on NaturallyCurly we've been exploring Self-Care Beyond Hair. Our Editor Devri practices self-care through thrifting, and Gerilyn, our Senior Copywriter, practices volunteerism (with puppies!). For me, self-care is something I practice in the privacy of my home, as a retreat from daily life. I like to do restorative yoga at night before I go to sleep because it's the best way to wind down and quiet my mind for my most restful sleep. It means that for 10 or 15 minutes I lay down in a yoga pose and do... nothing. That may sound easy to you, but as a night owl who's always felt most creative and alert at night, I find it incredibly difficult to shut my brain off and get into bed. Around 11pm is when I suddenly feel motivated to clean my whole apartment, reorganize my closet, and start a new creative project. Because I'm a night owl who also gets up early to walk my dog and get things done in the morning, that means that I'm constantly working on too little sleep. This is why my self-care sessions are critical to my health and being my most productive self during the day. Plus if I'm ever going to achieve my New Year's resolution of becoming a morning person, I have to start with my nighttime routine. You may be picturing strenuous poses, 100+ degree temperatures, and copious amounts of sweat, but that's not the point of restorative yoga. It's actually quite the opposite. Restorative yoga involves holding simple poses for long periods of time and relaxing deeply into them without thought or movement. One well-known pose is savasana, or corpse pose, which is as simple as lying on your back. But you can also incorporate gentle twists or stretches to really get the most benefits for your body. Restorative yoga is a gentle and healing way to stretch and move when injured, and is also a way to start practicing mindfulness. You can watch how I practice self-care in my living room here. As we've been exploring self-care this month it's struck us that there are so many unique and personal ways that everyone practices self-care in their own lives. I'd love to hear what self-care means to you in the comments below!